Customers are the whole reason your retail enterprise exists. Attracting new customers and keeping existing customers happy and returning to your store, is the essential task before you. If you do it well, you will be profitable. If you neglect your customers, you will not be in business long. Attracting customers and keeping them happy requires doing many things well, not the least of which is having the right merchandise in your store. But if you do not know who your customers are, it will be a lot harder to accomplish this an the many other challenges you face as a retailer. To really understand your customers-- where they come from, how often they are in your store, how they heard of your store, what they buy-- you have to store information about them you can later analyze and exploit. The Customer Catalog is where you manage all the information about your customers. This chapter will cover all of the Customer related catalogs. Refer to the Catalogs topic for a general explanation of how catalogs work. The terms Client and Customer are used interchangeably throughout this manual. Therefore, customer data is stored in the "Client Catalog." Most of the Client Catalog is used to store contact information about customers. On the right side of the catalog there are eight subforms that you can use to classify your customers. Client Number: This is a serial number that is automatically generated by XpertMart™. All client numbers are consecutive and appear in gray as they cannot be edited by the user. Client numbers are nine digits long and the first digits denote the store number where the customer was first added to the catalog. Customers added at the Main will have 999 as the first three digits. You will use the client number to run reports about specific customers. Login & Password: You can allow customers to access your data, either through an XpertMart™ Infostation or an XpertMart™ Web Store if you assign them a login and password. You would also have to create a user profile for them in the Security module. Account #: Use this field to capture any internal account numbers you may use to track customers. Company: This field is useful for wholesalers or if you sell to business and not just to consumers. Enter the name of the company they buyer represents. Name: Enter the customer's first name. Last Name: Enter the customer's last name. When you do a customer lookup at the point of sale, XpertMart™ looks up the customer Last Name first. 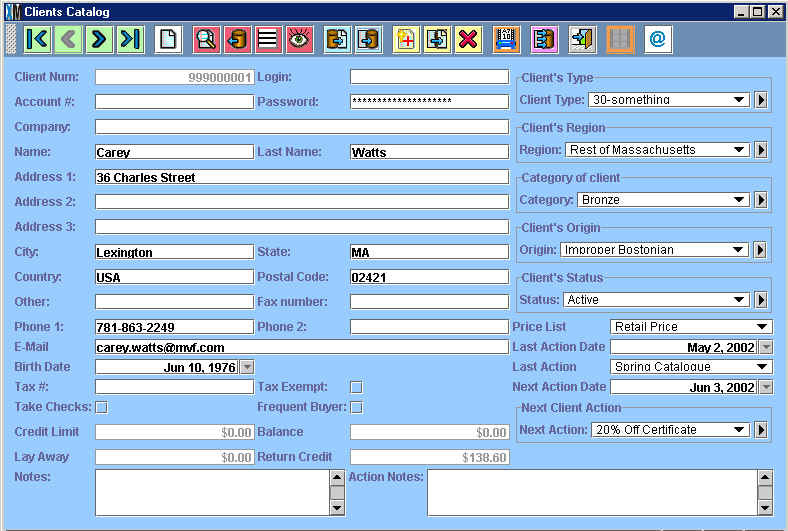 For example, to lookup Carey Watts, you would type "Wa..." in the client field in a transaction (and not Ca...). Address: Use as many of the three lines as you need, as well as the City, Country and Postal Code fields, to input the customer's address information. You can print the customer name and address onto labels. To do this, click on the labels button on the toolbar. (Make sure you have specified a driver in the Station Configure>Label Printer menu. Check with your Distributor to be sure you have the right driver for the labels you are using). Phone/Fax: These fields are for your own reference. Use them to store your customer's phone and fax numbers. Email: Enter your customer's email address in this field. You can send the customer an email directly from the Client Catalog by pressing the email button in the toolbar at the top. For more information, refer to the Email topic. If in Station Configuration you have activated the option to warn if the customer does not have an e-mail address, then if you try saving a customer's record and it does not contain an e-mail address then you will receive the following message window. If you want to add an e-maill address you click on the first button. After clicking on the "Add e-mail address" button, you will get a message saying the record was not updated. Then you will be returned to the client's catalog screen where the curson will be in the e-mail field ready to enter the customer's e-mail address. If you wish to save the customer's record with no e-mail address then you can click the "No e-mail address" button and the record will be updated as it is with an empty e-mail address field. The third button allows you to cancel the update. You will get a message stated that no records were updated. They you will be returned to the client catalog. Birth Date: Use the XpertDate™ tool to capture the customer's birthdate. This way you can send your customer's a promotion on their birthday. Tax #: Some jurisdictions that use a Value-Added Tax require retailers to record the tax number or fiscal i.d. of any customer requesting that the tax be waived or disagregated from the total. If this is the case, enter that number here. Tax Exempt: If you select this checkbox, then no tax will be charged to the customer. Even if the item being bought has a tax associated with it, no tax will appear in the invoice. Usually you will want to select this checkbox when taking phone orders from customers who do not live in the state or province the store is located in and therefore may not be subject to the sales tax. If a customer is buying merchandise as a gift to ship to someone out-of-state, make sure the customer you enter into the "ship to" field in the Invoice is tax exempt. To learn more, refer to the Taxes topic. Take Checks: This checkbox is for reference only (i.e. at the moment it will not actually restrict customers from using checks at the point of sale). In areas with high incidents of check fraud, retailers may wish to only take checks from customers who have been screened and approved. If this is the case, cashiers should be instructed to open the Client Catalog and verify that the customer in question has been approved. Frequent Buyer: Select this checkbox if the customer participates in your customer loyalty program. Credit Limit: For customers buying on credit, use this field to establish a credit limit. This fields requires XpertMart™'s Accounts Receivable module to be active. Balance: Typically used for wholesale customers buying on credit and who may carry a balance. This fields requires XpertMart™'s Accounts Payable module to be active. Layaway: This field displays the total balance of layaway payments the customer has made. The balance only reflects open Sales Orders as once the customer makes the final layaway payment she receives the merchandise and the field will once again display $0. To learn more, refer to the Layaways topic. Return Credit: This field displays the total balance of store credits the customer has in her favor. Every time a customer returns merchandise she may be issued a store credit. The balance is also printer on the sales ticket when the customer uses the store credit as a payment type. For more information, refer to the Return Credits topic. Notes: This is an open text area that you can use to capture any additional miscellaneous information about a customer such as special complaints they might have, sizes or sizes of their spouse and favorite brands. The subforms on the right side of the Client Catalog allow you to assign customers to groups. By aggregating your customers you can get a better understanding of your customers: where they come from, how they learned of your store, how they shop, and so on. It's up to you to decide what is it about your customers that you most want to know and what kind of groupings are useful. Using these embedded catalogs is optional: if your retail store is a low-cost, high-volume operation then you probably do not have the time or need to capture detailed information about your customers. On the other hand, if you run a high-end boutique where customer are given personalized attention, it makes sense to try to learn as much about your customers as possible. You may decide you just want to use one of these subforms or all five. If you decide to use the subforms to classify your customers, we recommend you train your cashiers to be discreet about gleaning information from your customers. The last thing you want to do is make your customers feel like they are filling out a tedious form. For example, if you are interested in learning the geographic region that your customers are from and their age, have the cashier casually ask, "Are you from out of town" and have her estimate the age. Then, once the customer has left the store, she can circle back to the Client Catalog and fill-in the information. Alternatively you can offer your customers an incentive for giving you information, such as promising them promotions in the mail or giving them a gift certificate. It all depends on how valuable this data is to you. You can use this catalog to capture virtually any trait about your customers that might be useful. For example, you might want to know the age range of your customers: if a quarter of your customers are in their 40s (perhaps shopping for their daughters) and you only stock merchandise for teenagers, there could be an opportunity there worth exploring. You might also be interested in learning how your customers shop: whether they shop alone, with children, with a spouse or a group of friends. It's no secret that shoppers who spend less time in your store are less likely to make a purchase. So if you learn that a third of your customers are shopping with kids, having some balloons or lollipops in your store might be a good investment: those extra five minutes of keeping the kid entertained might be the difference between their mother buying that $200 dress. (Or how about a stack of Sports Illustrated magazines near the women's dressing room for stranded husbands?) Likewise, if a quarter of your customers shop with their spouse, you might want to diversify your merchandise to keep both of them engaged. Use this catalog to track where your customers live. The geographic categories you use depend on the specifics of your business. You may want to track specific city neighborhoods or larger geographic regions. One retailer we worked with in Orlando was interested in know how many customers were coming from the Orlando region and how many were coming from Venezuela. When he realized that a large percentage of his customers were coming from Venezuela, he decided to advertise in a Venezuelan newspaper just before the Easter holiday. A retailer who was operating a chain of beach boutiques in the Carribbean was interested in knowing the percentage of customers coming from Europe and Japan to know whether he should accept payment in Euros and Yen in addition to Dollars and the local currency. Use this catalog to quickly sort customers. Suppose you want to send out a promotional flyer offering 10% off, but you only want to send it to customers who have spent more than $100 in your store. Rather than individually search through your customers every time you are ready to send out a flyer, you can create categories (such as Bronze, Silver and Gold) and go through once and assign each customer to one of these categories. From that point forward, any time you want to target your Gold customers you can run a Query to isolate these. Use this catalog to track how your customers first learned of your store. Every type of advertising you've employed should be included as an option: magazine ad (specify), radio, newspaper, hot air balloon in front of the store, etc. Breaking your sales down by client origin will give you valuable feedback in how you should spend your advertising dollars. Look out for any imbalances: if you are spending 40% of your advertising on tv but only getting 15% of your new customers saw the tv ad, you might want to reconfigure your advertising priorities. Use this catalog if you need to assign customers a certain status, such as credit terms. You might use Cash on Delivery, 15 Days and 30 Days as your status categories. Alternatively, you can use this catalog to capture any other trait you were not able to capture using the other four catalogs mentioned above. If you are using multiple price lists, you can assign a customer to a different price list. For example, you may want to assign your wholesale customers to a wholesale price list different than your retail price list. Or you may want to create a VIP price list for your very best customers. When one of these customers makes a purchase, XpertMart™ automatically pulls the price from the price list you've indicated. To learn more, refer to the Prices topic.